I had to add Kevin Wada’s variant cover to my Wishlist. Amsterdam. Cerebra confirmed that this is where the Rasputins can find Nightcrawler. I like their fun banter, also the explanation of why Illyana never teleports people to the exact location (or makes a second teleport, once they know where they need to be). They see a puddle of blood and knock the door down. Is that really Kurt’s tail on the ground!?! Can he grow another one of those? That’s a major physical change! Neepawa, Manitoba, Canada. Storm and Iceman confront Old Man Logan. Bobby doesn’t waste any time asking about how Wolverine got so old. Before he will answer that question, he wants to know why these two knuckleheads are flying around in a Sentinel. Storm explains that Forge created Cerebra (inside a Sentinel, for some unexplained reason). Storm hints that the mutant race’s downsizing. Cerebra apparently can talk and has a personality, this could be interesting. Old Man Logan explains that he was in a few places, before coming here – the only hint of Secret Wars 2015, I imagine we are going to get, for a while. 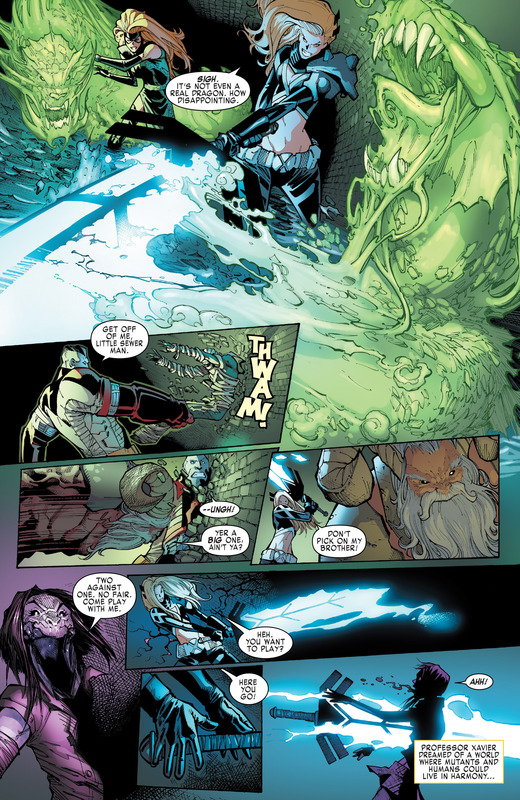 We see flashbacks of dead Storm and Iceman, from Wolverine 70, that made me reread that issue. I was resisting the review for that issue, as I figured it would be the basis of the third Wolverine film but it is now time to review the issue. That’ll come in a few days. Storm is wearing a classic 80s costume, which is what made me reread Wolverine 70, as I wasn’t sure if she was in that outfit. She’s in something like resembles a one piece black bathing suit, so Ramos got that right, from the very brief glimpse we see of Storm. We get a pretty decent summary of the original Millar / McNiven Old Man Logan storyline – the villains rose up, took over and left the world a Wasteland. At least, the aspect of the series that I was interested in. Iceman’s flippant “of course this involves time travel” is pretty funny. We have the Original Five X-Men, from the past, and now, an Old Man Logan, from the future. Are we heading towards another Battle of the Atom? Let’s hope not! We see a dead Iceman, in a flashforward, who I couldn’t identify in issue 70 of Wolverine. Old Man Logan has never heard of the Terrigen Mist or M-Pox. Old Man Logan turns down Storm’s offer for help. She states, in no uncertain terms, that Cyclops is dead. Which, is like solving a mystery with another giant mystery. I completely get Old Man Logan not wanting to explain to these youngsters, why he doesn’t want to stand around them. Brooklyn. Jean is dating this guy, Chris. She makes light about how Hank and Scott, didn’t work out. She goes as far as to say that kissing Hank was like kissing her brother. Which seems super awkward, as Bendis was setting up the whole Jean and Hank relationship in Uncanny X-Men 600. I suppose it is an easy way to show the passage of time, having the couple break up. Jean likes kissing Chris. They start walking out of the restaurant when Jean hears a psychic yell for help. These three dumb flatscans are kicking this dude who looks like that Flower Dress gal from Agents of SHIELD, once she was exposed to the mists. Jean yells at them to get away, but one of the jerks states that he is afraid of his little girl may get the M-Pox disease. Chris makes the huge mistake of using the “mutie” term and Jean reveals that she is a mutant – in a big way. She knocks the three jerks to the ground and away some distance. Chris is disgusted that he kissed her, he may get the disease now. In a very great twist, the mutant stands up, also freaked out, as he is an Inhuman and runs away scared. What an interesting take on an old plot. Also, a great way to show that one rather be an Inhuman than a mutant. X-Haven. The Workshop. We get our first glimpse of X-Haven, at least, Forge’s workshop. He confirms to Illyana, that Nightcrawler should be right below them. He does warn that there are other mutant signatures. Manhattan. 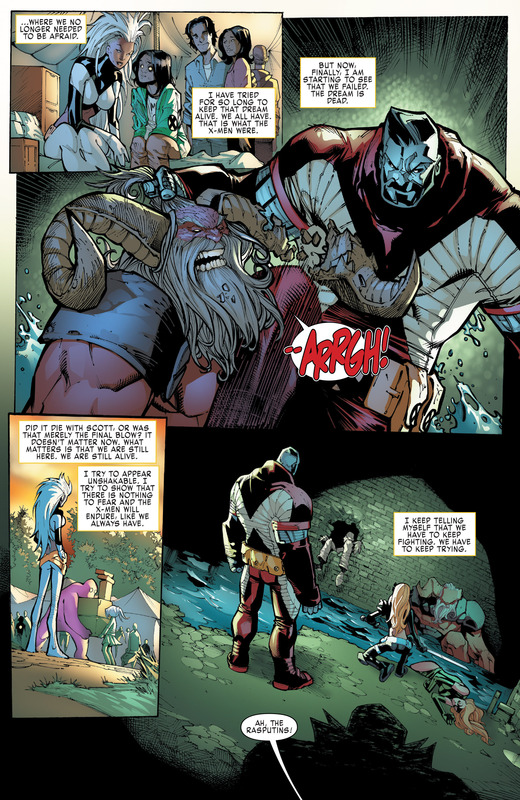 Illyana sends Kurt’s tail to Forge, so that explains how that will be corrected. In, what I hope continues to be a running gag, Colossus is dismayed as the sewer entrance is too small for him. The big Russian is starting to have size issues. For once, an X-Man complains about being in the sewers! The smell and the water, must be gross to deal with. They are attacked by green ghost dragon thingies. X-Haven. 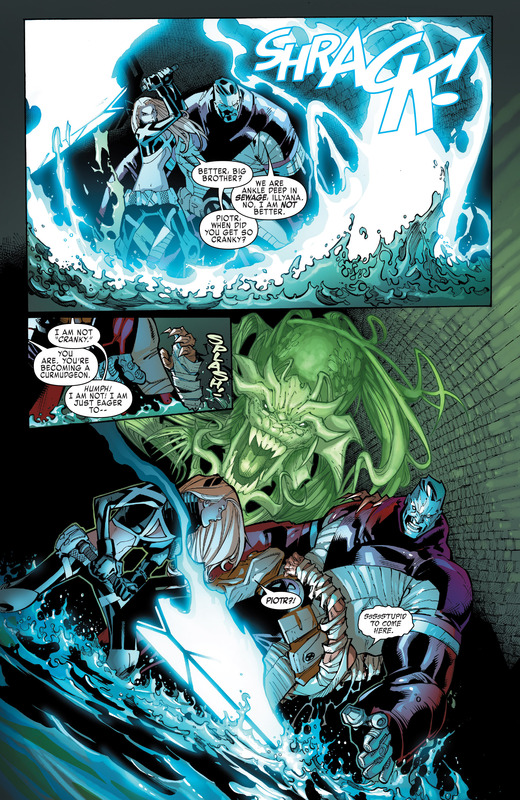 Storm, Iceman and Cerebra return. Storm doesn’t like how Magik hasn’t returned yet. Bobby hints that where they are, it isn’t good for Magik to not be there, for long. Storm’s instincts really should have kicked in and they should have gone right to Manhattan and checked in on the siblings. Bobby really is the comic relief that this title needs. He notices Kurt’s tail, another signed that clearly what is happening in Manhattan, isn’t ideal. Bobby freezes Kurt’s tail. 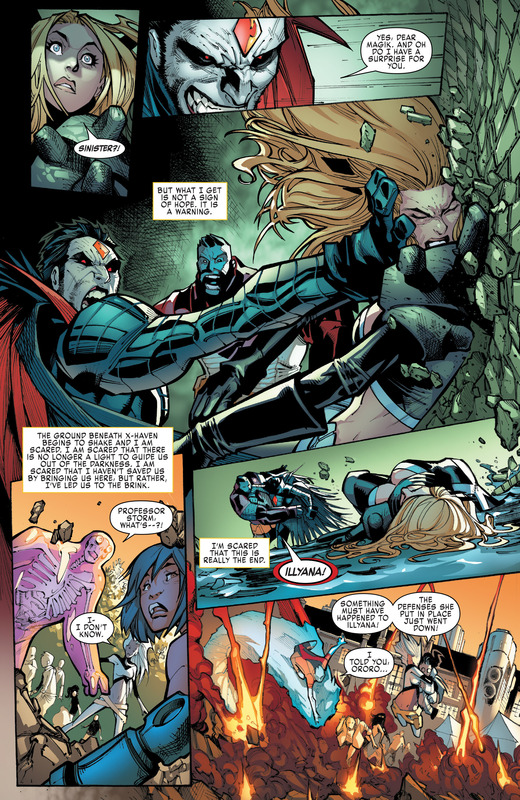 Forge checks in on Cerebra, whose feelings are hurt by Old Man Logan’s comment to her, to “zip it.” Forge is also told that there is a Logan, around, there is no time to explain further. So from Forge’s point of view, Storm failed two different recruiting agendas. Magik can tell the dragons are not real. 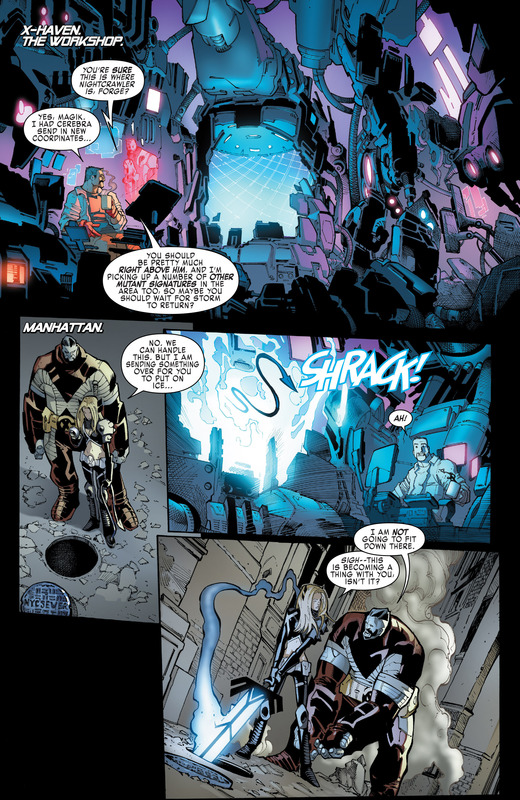 Colossus and her are doing well against the two mysterious villains, from the last issue. We get a narration box sequence of Storm talking about how Xavier’s dream may be dead (again). We see who the mysterious boss of the three sewer peeps . . . Mister Sinister! Who is willing to set aside his obsession with the Summers blood, to experiment with the Rasputin bloodline. Am I excited to be reading another Sinister storyline? Not really but maybe this will be the time where I find him to be interesting. I was thinking this may be the first time that Magik has seen Sinister but Gillen’s entire Uncanny run (the second volume) he had fought the Phoenix Five, so she definitely should have shared at least, one panel together. Though I am getting the sense memory of her being outside the castle, so she didn’t actually fight him. It is funny, that, the two of them had major storylines in Inferno, but didn’t crossover in that, er, crossover. 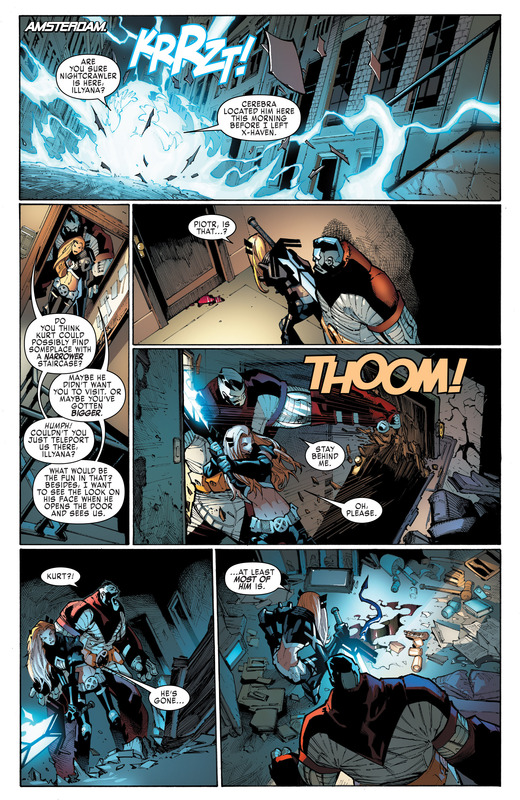 Sinister, the jerk that he is, throws Magik’s flippin’ head into a wall! Causing her to be knocked out. X-Haven, not coincidentally,starts to shakes. This is, because . . . X-Haven is in Limbo, ya’ll! 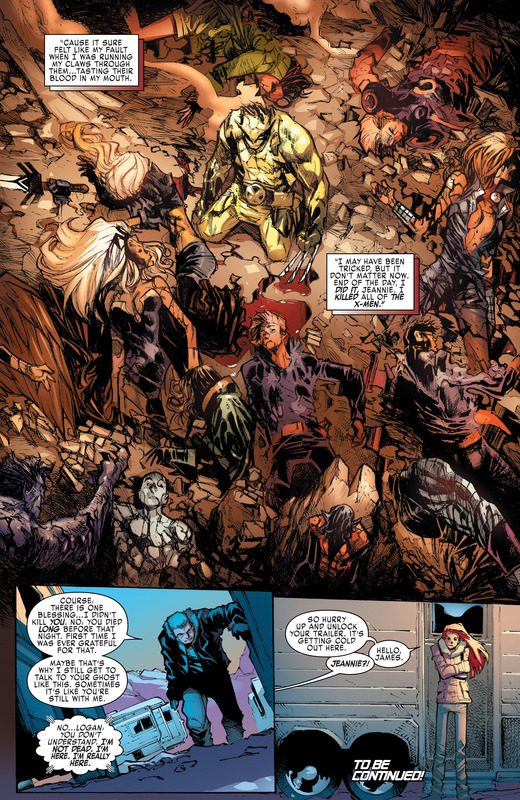 So in the eight months, Illyana removed Limbo from within herself and have placed the mutants there. Since Magik isn’t keeping the demons at bay, they start hording onto X-Haven. Manitoba, Canada. Old Man Logan is trying to forget his woes, via drinking and supporting a small business. Jean starts chatting with him, telepathically. She knows his secret, as of course she would read his mind – without his permission. So Lemire definitely has her character down – she is the worst. Jean is in front of his trailer, and wants him – as it is cold outside. Old Man Logan is glad that she was already dead, as that meant he didn’t kill her. 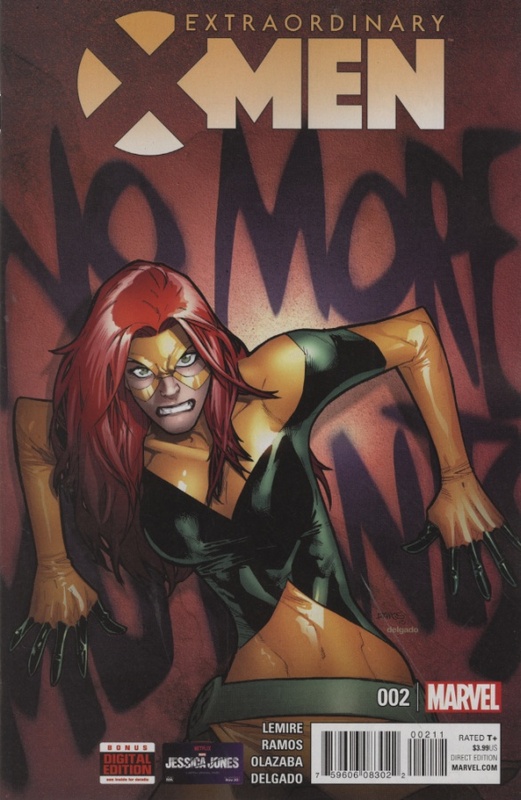 Our Wolverine, did end up killing our Jean, a couple times – during Morrison’s run, but that was knowing she would come right back from the dead. A pretty great second issue!